Yesterday I shared a picture on my Facebook page of a Chile en Nogada torta, available at a café in the centre of Oaxaca. I have to admit that I was intrigued as to what this traditional Independence Day dish would taste like in a torta so in honour of research, I went and ate it! Now, let’s start from the beginning for those who I lost at the words Chile en Nogada and Torta. Firstly, a torta is essentially a warm sandwich made on a white bread roll that can have any number of different fillings. Secondly, Chile En Nogada is a poblano chile stuffed with picadillo (minced beef, with fruits, nuts, herbs and spices) covered in a white sauce made from walnuts and sprinkled with pomegranates. It is considered the Independence Day dish because it represents all three colours of the Mexican flag, red (pomegranates), white (walnut sauce) and green (poblano chile). I love this dish, and look forward to it every year, but I have to admit I wasn’t entirely convinced that encasing it in bread was the best idea. I became even less convinced when I saw the price. This torta was 98 pesos! Tortas are usually about 20 pesos so this one was 5 times the price. Just as I was considering leaving, the waitress came over and I thought this is too unusual to miss and I ordered it! 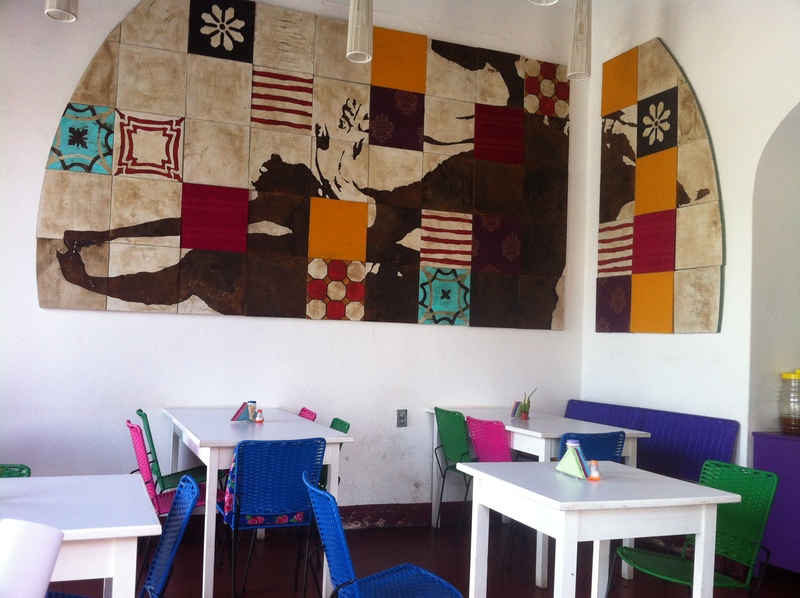 I love the decor in the cafe too. What arrived in front of me could possibly be one of the most incredible things I have eaten in my whole time in Mexico, and that is truly saying something! First off, it looked beautiful, just like the picture that I had shared the day before. Biting into the torta my mouth was in heaven, with every single one of my taste buds firing. The sweet-tasting meat was delicately offset by the spicy hit of the chilli, while the creamy, nutty sauce cooled my mouth as the pomegranate added a hint of sharpness and the crispy bed gave it the most wonderful texture. I feel almost ridiculous describing it like this but I was quite literally in a meditative food trance. Chile en Nogada in a torta definitely works! So, if you live in Oaxaca or you are passing through, go to La Popular and eat this little piece of food heaven. Well, it is actually quite big so take a friend, a lover and family member, anyone and share in this joy together. I think this dish was made to make El Grito (the Cry of Independence) even easier; Qué Viva México y la Torta de Chile en Nogada! I love La Popular and wrote about their Chiles en Nogada last September . 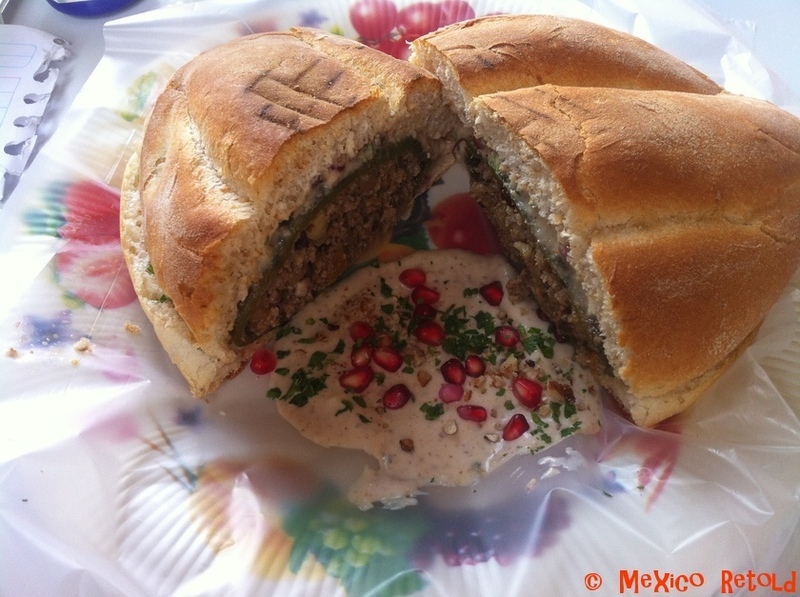 Now will have to try their Chiles en Nogada torta! Ooh wonderful, I just had a read! I really recommend the torta. It sounds so wrong but to me it was so right! Well, it seems I need to try as well! Thanks for the enticing description. Heading to food heaven!